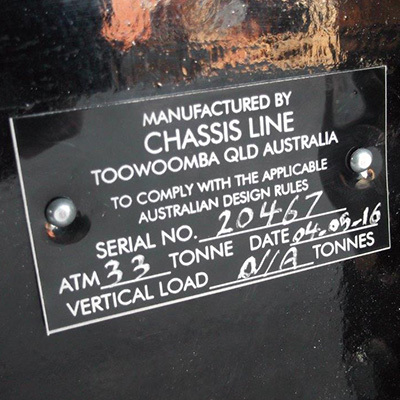 Chassis Line Toowoomba has had Approved Persons authorised by Queensland Transport since 1984. Our approval codes are listed below. Mod plates or “blue plates”are something you should definitely look for on any used vehicle you are purchasing especially if you think the vehicle is no longer original. With a truck you can obtain a build sheet from the manufacturer that will provide you with the information required to establish if the vehicle is still original. The same applies to some trailer manufacturers. There are still many vehicles out there that have been modified that have slipped through the system; generally these vehicles even though they have been in service for some time, have not been modified as to the Code of Practice & in some instances have been expensive to resolve. Chassis Line in Toowoomba offers modifications as a service or we can certify a previous mod for you. Please check the below list, you will quickly appreciate just how many everyday fit-ups trigger the requirement to get a mod plate certification. 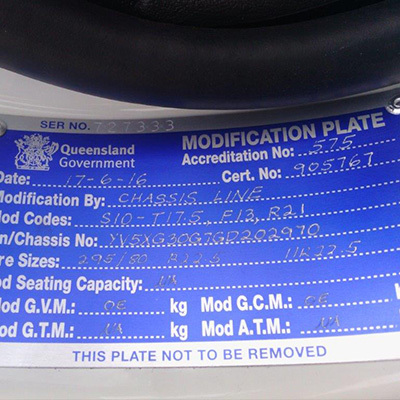 If the modification your require is not there follow the Queensland Transport link below to view all the codes, the department will advise you on who is your closest certifier. If this process is too difficult due to your location or circumstances please contact our engineering department, they can assist with the certification & work jointly with any certified examiner. Modification plates are also applicable for some trailer repairs or refurbishments that are required from accidents & general wear & tear. Chassis Line Toowoomba hold all the required codes which are in the below list. Chain of responsibility & duty of care places the onus on the owner of the vehicle with regards to modifications that are not certified & may expose you to monetary fines, insurance cover issues & down time if not addressed correctly.